Find the latest Nikon D7100 discounts and offers updated November 29, 2013. 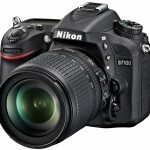 Current D7100 deal: $100 off the D7100 body only, or $200 off the D7100 and 18-105mm VR lens. Free Accessories: Retailers are offing camera bags, extra batteries and/or SD cards FREE with purchase of the D7100. Limited time offers, see retailers below for details. 2-4% Rewards: For a limited time at select retailers, earn 2% to 4% or more of your purchase price as credit toward a future purchase. Amazon: Free camera backpack and 32GB SDHC memory card with D7100! The Nikon D7100 is available NOW! Originally announced to ship on March 21, 2013, but was already available as early as March 13. If you had pre-ordered early probably already received your camera. There is still high demand for this camera and stock is just now catching up with demand. The retailers listed on this page are Authorized Nikon Retailers so you know by ordering from them you will receive the full Nikon USA warranty. I have used SDXC 64GB card recently. Unfortunately, I can’t use it anymore, I got the message “All images are hidden”. I want to unhide the images, but the files are not seen. Perhaps I dameged the card pulling it out of the camera during it was on. The card is OK in the second camera. Go the playback menu (Menu > Playback) and then use the right arrow or OK to to enter and select the images to hide/unhide. The hidden images only affect in-camera viewing. The files are still on the card.